At Design West Landscaping we have been installing driveways throughout Northern San Joaquin Valley and East Bay area for both residential and commercial properties with great success. We are a full service landscape and hardscape company specializing in the installation of pavers for a wide range of applications. As a professional paving and concreting company, we have a team of highly experienced designers and contractors who have created many stunning driveways over the years. Thus we have gained a long list of very satisfied customers. 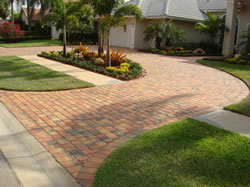 Your driveway is an important feature that needs to be strong and sturdy as well as add some appeal to your property! 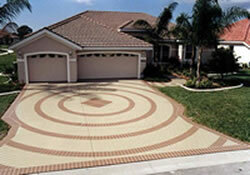 The paving of your driveway should be left to the professionals. Our experienced team of paving contractors will guide you from planning and design, all the way through to the installation and maintenance. Driveway pavers will provide you with a strong surface that will be able to handle heavy loads and still remain solid through the years. If it's a concrete driveway you're after then we at Design West Landscaping can do that for you too. We have a team of professional concrete contractors specializing in the design and installation of stamped concrete and poured concrete driveways. Concrete is and has been an extremely popular material for a long time and there is good reason for that. 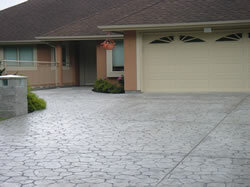 Not only does concrete make a durable driveway but it will also make an aesthetically appealing one too. It is recommended that you acquire the help of an experienced concreting company so that you will be assured of the best end product. We have all the necessary tools and knowledge to get the job done properly and all you need to do is sit back and watch it all come to fruition. Contact the team at Design West Landscaping today and we will get you on your way to having a stunning new driveway!